Make sure you understand what format you are writing in before you begin. You will take a different approach depending on whether you are writing a term paper, a report, a research proposal or a dissertation. Knowing your audience is essential before beginning the writing process. A different vocabulary and writing structure are necessary if you are writing for an audience outside of your discipline. Ask a friend or advisor to read it over and take their advice! It's never too early to start a paper and when you leave it to the last minute you risk disaster. A coherent argument takes time to develop and you won't have time to edit properly if you write a paper the night before it's due. So get out your planner and think ahead. 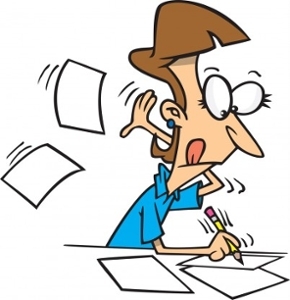 After putting a lot of effort into a piece of writing it can be difficult to know when to stop. A piece of writing needs to be effective, not perfect. There's no such thing as a perfect essay so if you've made an effective argument, let yourself feel the exhilaration that comes with being done! Effective writers demonstrate their ability to clearly express ideas through simple language and supporting arguments. You might try writing at the same time every day or setting goals such as writing a certain number of words daily. There is no magic formula. Find out which strategies work best for you. It's easy to get bogged down in the research phase of a writing project. Starting out with a clear research question that you want to answer can help you focus. Once you know the direction you want to take, narrow your research so that you focus only on the literature that will help you defend your thesis. Organizing your findings in your outline will help you create a more coherent argument in your paper. The best papers allow for a logical progression from one section to the next. Examining past thinking and research (historical context) and then progressing to the future through discussions of relevance and impact, will give your work an intuitive logic and help your reader follow your argument. A pronoun must refer to a single, particular noun. Correction: The goblet broke when Samuel dropped it onto the glass table. Tip: you can do a text search for words such as “this”, “that” and “it” while proofreading to help avoid this common error. Make sure that your pronouns agree (singular or plural) with the nouns to which they refer. Example: If a student parks a car on campus, they have to buy a parking sticker. Correction: If a student parks a car on campus, he or she has to buy a parking sticker. Many writers write long sections of their paper in which they discuss multiple ideas. You can convey your ideas more clearly if you stick to the one paragraph - one idea format. When explaining complicated material don’t be afraid to use devices such as analogy and metaphor to get your point across. These figures of speech can create interest as well as greater understanding of complex ideas. Try asking a friend to read your work. Someone else can often catch some of the things that both you and your software miss. A clear outline help you organize your writing. Outlining allows you to determine the flow and logical progression of your paper. The more detailed the outline, the easier it will be to consolidate your ideas into a polished piece of work. The 'storyboard approach' is an effective way to create an outline. The body of the paper represents most of its length. The body presents the arguments laid out in the introduction and gives supporting evidence using a variety of references or results. A stronger body portion uses multiple lines of evidence to support your idea. The discussion section of the paper synthesizes the arguments presented in the body. It also places those arguments in context, relating them to other ideas and debates, highlighting any new ideas or contributions to knowledge, discussing the implications and applications of your work, or identifying remaining questions. The connecting points are essential to the continuity of your paper. These areas (illustrated by arrows in the storyboard) link the different sections of your paper together to help create cohesion and also link each section back to your main argument. 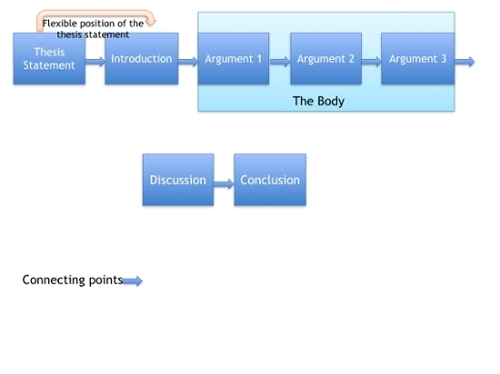 The conclusion consolidates the main points made in your paper by expanding on the thesis statement. This is also a place to address the next steps or future projects that can be considered based on the research you have conducted. This is not an area to present new information but rather to reinforce the purpose of your paper. This page was created by Isabella Graham and Ramsay Macfie as part of the 2014 Professional Development class.